Oh brother, tomorrow I have my first surgery for cataracts. I'm excited but scared. But, it's all part of the adventure plan. Now I'll be able to see at night,or in dim light. Roger held up a coffee cup the other night and said, "oh look, it's caked inside". I couldn't see a thing. That's why when I thought I had washed it, it was clean. Sad. I remember going to my Mum's house when she was a lot older seeing glasses that were pretty dingy. My mother was always immaculate in house keeping so this made no sense. Now I know, she couldn't see it. So today I'm at the studio in my friend Lou's room. She's letting me share the space so I can get some work finished. We are both in a show at the 5th Avenue Gallery , the end of July, called Homes. The challenge is to paint, make, construct what you would call home! 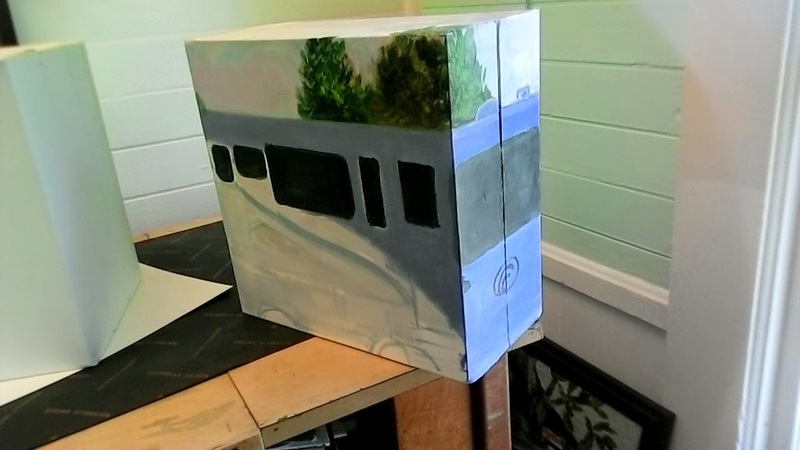 I glued together two 12" x 12" x 3" canvas and painting my RV. Working to make it somewhat realistic. I will also be adding wheels. 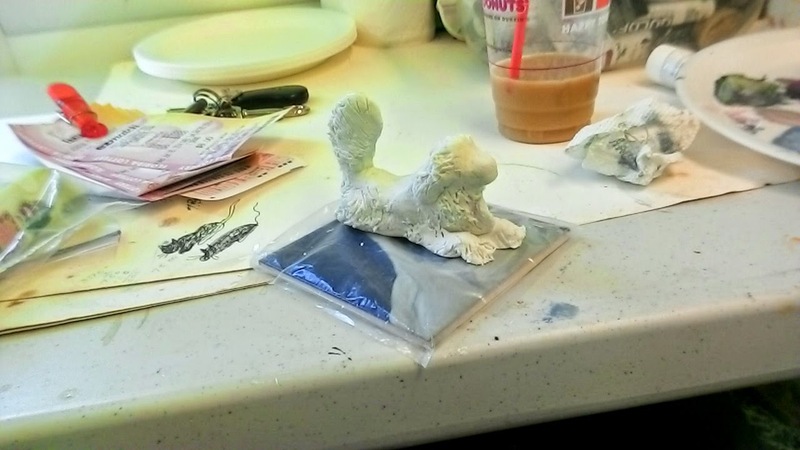 then to really add to the realism, I'm making Lola out of clay. We'll see how it turns out. I may end up just painting her in a window. The show will benefit the South Brevard Sharing Center. RV travel news. Roger made a two week reservation at Big Hart Campground for September. We will be finally on the move. We need to find a place for two nights just before that as we don't want to drive for long periods during the day. We are heading to Myrtle Beach for Roger's submarine reunion. It will be different having the kids with us this time. We can take them for long walks on the beach, yeah..dog friendly, then at night they can hang with me if Roger wants to go and tell the same stories yet one more time. Oh..did I just say that out loud???? Anyway, wish me we'll and if I. can see I'll pop in tomorrow night. If not, see you Thursday. Good luck tomorrow! You will be fine. And probably an even better artist! I'll be thinking of you. Love the painting challenge too! Good luck tomorrow! Just be sure to let yourself take some time to rest. It will all be worth it!! Hope the surgery went well today. You will be as good as new before you know it. Am excited about your traveling across country. Will get in touch with you soon.